Scholarship recipients at the 2018 scholarship gathering. Partners in Island Education now oversees four scholarships as part of its mission to enhance educational opportunities for the students of Vinalhaven. Two of these scholarships are for post-secondary education. Due to unforseen circumstances this year, our deadline for the Vinalhaven College Scholarship and Ogden/Chaffey Scholarship applications has been extended until March 15th, 2019!! This scholarship was developed with the goal of providing a substantial financial award each year to one graduating senior going on to a four-year college. 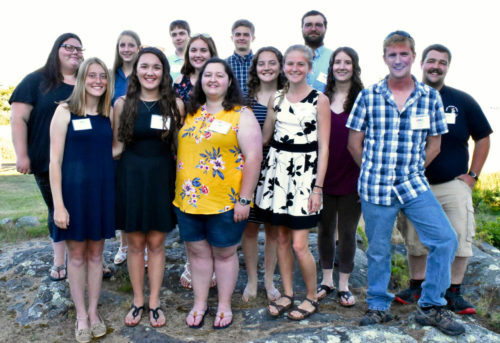 The people helping to create this scholarship are members of the summer and year round community, including Vinalhaven school teachers and administrators. The first award was given in 2006. The scholarship is for a total of $8000 – $2000 for each year of college. Established in the spring of 2010 with a generous donation from Ms. Mary Jean Ogden, a long-time summer resident of Vinalhaven, the Ogden Chaffey scholarship is a one-time award of $1000. Two of these scholarships are awarded to the highest scored students attending a 2-year, 1-year or vocational program. If there are no students in the applicant pool for one of those programs, the scholarships are awarded to the students attending a 4-year school who have the 2nd and 3rd highest scores. In creating this scholarship, Ms. Ogden hoped to inspire donors to give gifts that keep on giving by donating to PIE’s endowment. Meet some of our scholarship recipients by clicking on this PowerPoint link!